People who are searching for unique games to play look for themes that haven't been repeated hundreds of times. Tribal and Native American themes have been done quite a bit, unfortunately, and the Fire Hawk slot machine from Microgaming does its best to be unique. 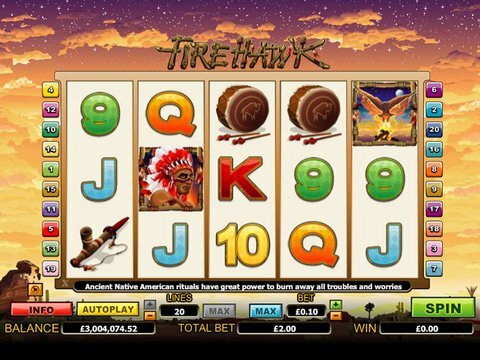 You can review it for yourself with the Fire Hawk free play slot demo that is available right here on this page with no download and no registration required, and it is even accessible from most mobile devices. In this Canadian slots title, you'll be able to decide to wager anything from a nickel all the way up to $200 per spin. That's quite the range for a prize worth 6000 coins - as much as $60,000 depending upon the coin you choose. The Chief acts as the wild on reels two and four and it takes the place of all of the regular icon s to create winning combinations. The Hawk itself is the scatter, and you'll get one of three different free spins rounds when you see three or more on your screen. The options, which are awarded to you at random, include 10 free spins with 4x the wins, 15 free spins with 3x multipliers, and 20 free spins with a 2x multiplier. Vikings are another fun way to enjoy some gambling, and the Vikings Treasure slot machine from Net Entertainment offers that up in great form. You'll find all of the icons you'd expect, including a Treasure scatter that awards 15 free spins and a Viking who acts as the wild symbol to replace others and create winning combinations. While there isn't a second-screen bonus round here, there is enough going on with plenty of wilds and free spins that you're sure to enjoy it.